Rugby’s on. Gotta give the cones to someone! Rugby’s on for tomorrow. 9:30, 17th and Constitution. I think the rain should stay away. I’ve got the cones but unfortunately I can’t make it tomorrow. I unexpectedly have the responsibility to help a “friend” move. Is someone free to take the cones from me? I’d be more than happy to drop them off tonight or early tomorrow morning. Just let me know by responding to this post and I can email you from there. Thanks. 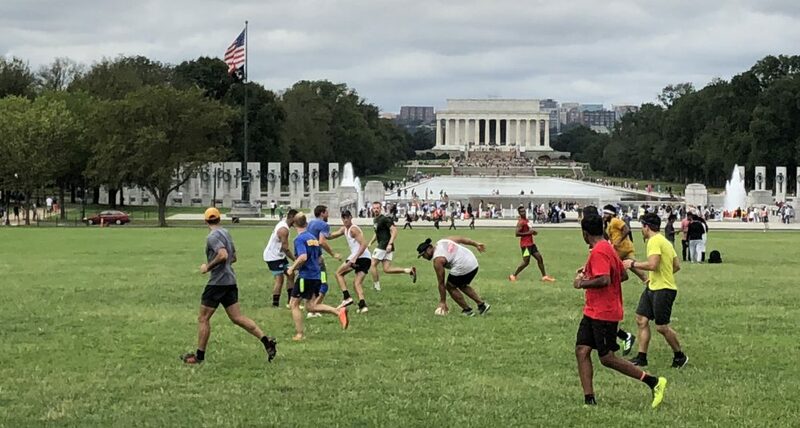 Hi guys, I’m in DC for a few months and played a lot of touch, tag and full rugby back in Ireland. Is there a certain way to join or may I just turn up? Sorry to pop this in under you cone post but just looking to keep the rugby going. Mark, we always welcome new comers. We’d be happy to have you join us. Did you find a mule for the cones? I’m headed out for the evening but can grab them in the morning or something. I’m a new guy, too (played once in December), but I’m at 312.772.8890, if you need somebody to haul them down.